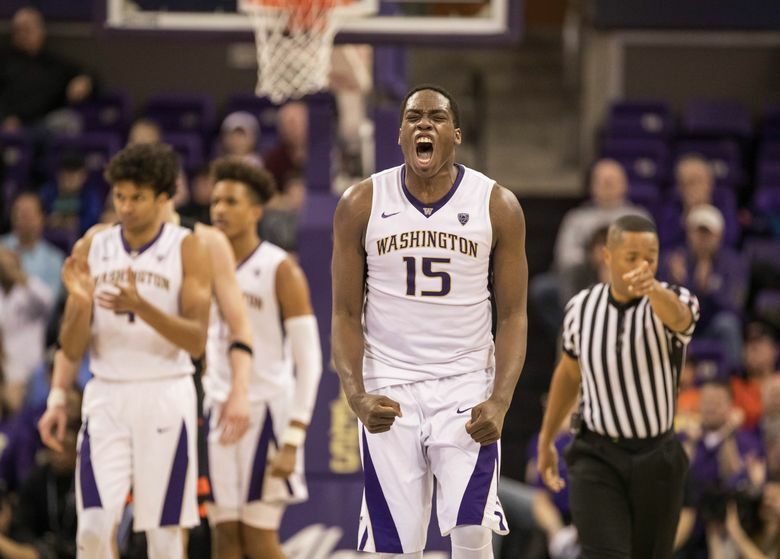 Noah Dickerson, who was second on the Washington basketball team in scoring and first in rebounding last season, has reportedly withdrawn his name from the NBA draft. Tuesday was the final day for players who had declared for the draft — and who had not hired an agent — to pull their names and return to play for their schools. Jeff Goodman from ESPN and Jon Rothstein from CBS Sports tweeted Dickerson was returning, citing a source. Dickerson, a 6-foot-8 forward, averaged 15.3 points and 8.3 rebounds as a junior, helping lead UW to a 21-10 record that surpassed most expectations in Mike Hopkins’ first season as coach. With Dickerson’s reported decision to return for his senior season, the only one of the Huskies’ top nine scorers not coming back is wing Carlos Johnson, who will transfer to WAC powerhouse Grand Canyon. Matisse Thybulle, the reigning Pac-12 Defensive Player of the Year, also contemplated entering the draft early but announced last month that he would return for his senior season. Noah Dickerson is withdrawing from the NBA Draft and returning to Washington, source told ESPN. Noah Dickerson is returning to Washington next season, per a source. Entered 2018 NBA Draft without an agent.